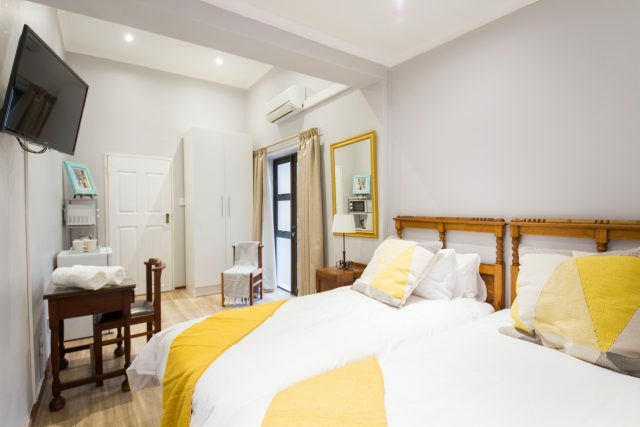 This self catering unit offers a large tastefully decorated room with the following: twin beds, desk, TV, Lounge chair, fridge, microwave, kettle, WIFI, shower, outside entrance, secure parking, access to swimming pool. It offers easy access to the N2 and R44. Should it be required, there is a studio on the property, which can be used as a small conference room, workshop space, photography studio or dance studio. Should you require less than a week, please contact us for price. If a stay is for more than a month, the room will be serviced 2 x week and linen will be changed 1 per week. Note: Full payment is required at time of booking to secure the room. To find out more, please contact us below…….